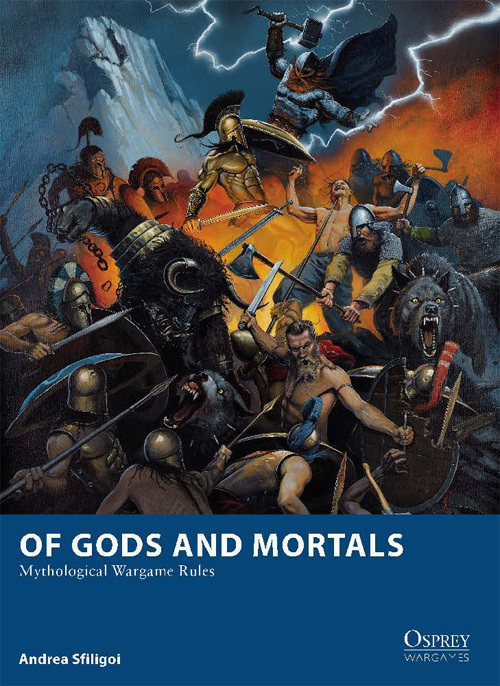 Of Gods and Mortals is a skirmish wargame that gives players the opportunity to command the greatest heroes, warriors and monsters of legend – and the gods and goddesses that ruled over them. Whether you want to lead the forces of Greek, Egyptian, Celtic or Norse mythology to battle, or build your own pantheon, Of Gods and Mortals presents everything you need. Each player takes control of a god, a handful of legendary characters and a number of mortal troops, forming a warband that must work in harmony to succeed. Although the gods are incredibly powerful, they are only as strong as the faith of the mortals who follow them – if their worshippers are cut down, gods become weaker, and if a deity is vanquished in combat, its followers may flee the field of battle. Success lies in employing a strategy that uses all your troops, from the mightiest to the most humble, as effectively as possible. As a signed paperback directly from Andrea Sfiligoi’s website, Ganesha Games.